The eye produces a small amount of fluid like water in its middle chamber, which flows around the lens of the eye into the front chamber. The fluid leaves the eye using a drainage network and then enters the bloodstream. Commonly, glaucoma causes the drainage system to become blocked, and fluid becomes trapped in the eye. This causes pressure to build up in the eye and pass to the nerve at the rear of the eye. This nerve may become damaged by glaucoma. Is glaucoma linked with diabetes? People with diabetic retinopathy have an increased risk of glaucoma. This can happen if abnormal blood vessel growth, which can occur as a result of retinopathy, blocks the natural drainage of the eye. Glaucoma has very few symptoms in its early stage, so people may be unaware that something is wrong with them. As someone with diabetes, an optometrist or another eye specialist should test you for glaucoma at least once each year. Glaucoma may be diagnosed by an optometrist by measuring your eye pressure, checking the eye at the optic nerve, and testing the field of your vision. A common test these days is a noncontact tonometry test (NCT test) in which a brief puff of air will be directed into the front of your eye. The machine you sit in front of measures the resistance of your eye to the puff of air without needing to make contact with your eye. The puff of air is noticeable but is not painful. Experts will quickly be able to determine if you have glaucoma. Your healthcare professional will be able to advise you further on the most suitable drops for your condition. Alternative treatments include laser treatment (laser iridotomy) and trabeculectomy surgery. What is the worst case scenario, will I go blind? In developed stages of glaucoma, poor vision starts to spread, which can extend to include the whole of the sight. 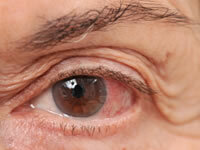 If the pressure of glaucoma can be successfully eased, however, the condition should not deteriorate further. Should your vision become significantly impaired, there are a number of aids which can help people with diabetes who have visual impairments.